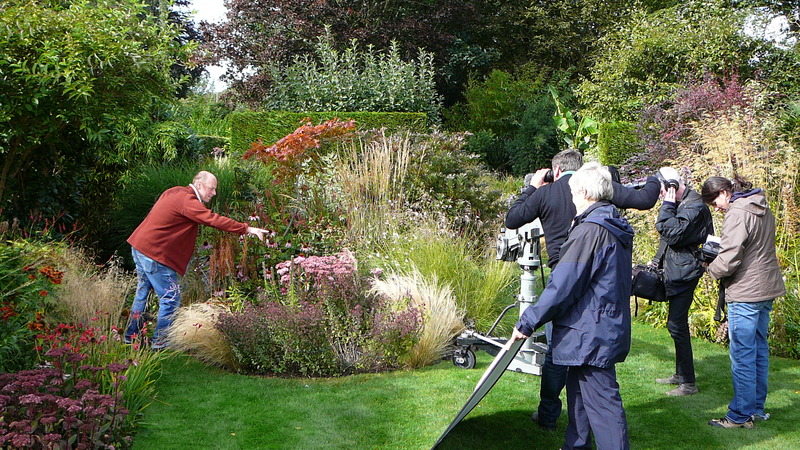 The gardens of Herts HPS members Adrian de Baat and Julie Wise are to be featured on Gardener’s World, as one of four short inset films on garden design styles to be screened at the beginning of the Spring 2013 series. 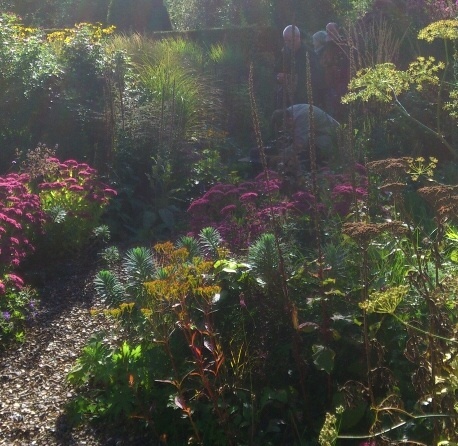 The two gardens have been selected to illustrate the naturalistic or ‘prairie’ style of planting. Joe Swift and a camera crew visited Hertfordshire in late September and spent a day filming at Rustling End and Digswell Road. Julie says it was fascinating listening to Joe talking about the use of gravel in the garden and how readily plants self-seed into it. He observed that gravel allows a cool root-run in summer combined with a protective mulch in winter, and visually offsets grasses particularly well. He also talked about the low-maintenance aspect of naturalistic gardening, and how leaving seedheads over winter provides a valuable food-source for birds and structural interest until the early spring. Joe Swift does a piece to camera, at Digswell Road. Adrian and Julie will not be appearing on the programme themselves but the publicity will no doubt be useful when it comes to opening their gardens for the NGS next year. We’ll keep you posted and let you know when the piece is to be aired. Posted on October 8, 2012, in Member's Garden, News 2012, Open Garden and tagged camera crew, Gardeners World, Gravel Garden, Joe Swift, nature, plants, prairie style, Television. Bookmark the permalink. 4 Comments.